Passive Cooling - SAITM Malabe | Design Cues - Chartered Architects, Interior Designers. This educational Institution is located in Malabe on a sloping site, exposed to high breeze from the East and West due to vast paddy fields, demanded an economical design concept in keeping with a “Eco Friendly Green Campus”. The Master Plan consisting of three stages included Campus block, Laboratories, Recreational Facilities. A column grid placed on the slope, supported the 1.5 m x 6m pre cast R.C.C panels placed by a crane located in the center during construction. Exposed services and basic finishes such as cement floors allowed speedy construction, creating a modernist minimalist aesthetic. 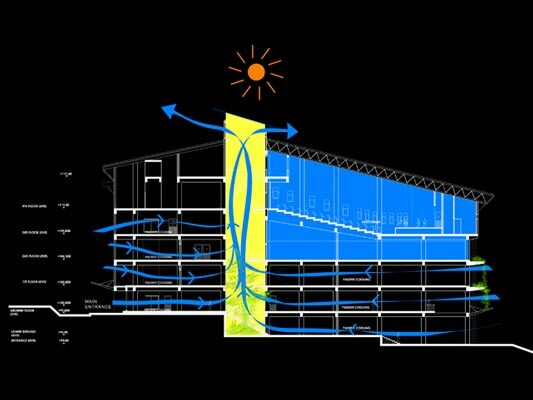 The energy saving concept focuses on “ Passive cooling” wind moving from East & West through the Atrium, requiring air-conditioning only for I.T. department and the Auditorium. Rain water harvesting and recycling of waste water by bio degradable mechanism are integrated part of the Master Plan. Finally the building was completed within one year, for both design and construction and at a considerably low cost of less than Rs.4,000.00. per sq.ft This iconic structure stands tall in the wilderness painted in a colour of the soil unearthed during construction.